Below are rope halters for sale. 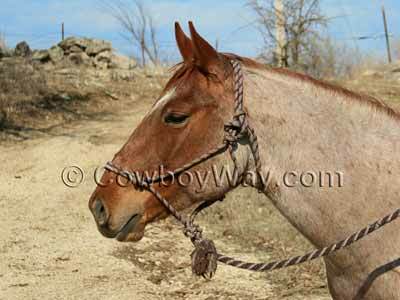 Some of the halters come with a lead rope, and some are just the halter alone. There is usually an excellent selection to choose from in different styles and colors. 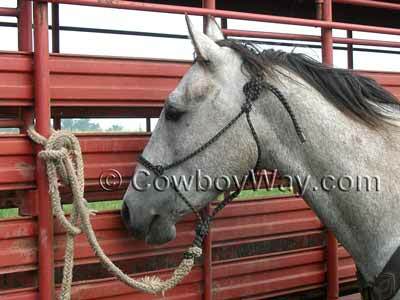 Below: A rope halter on a roan mare. Below are some good things to know when shopping for rope halters on the Web or anywhere else. What size is the halter? Even though rope halters can be forgiving when it comes to fit a rope halter should still be the correct size. Common sizes include "yearling," "standard," "medium," "large," etc. Does a lead rope come with the halter? If so, is it detachable or permanently attached? What is the rope halter made of? What is the diameter of the rope? Are shipping charges included in the price, or are they extra? Below: A rope halter on a ranch horse. If you find a halter you like but you're not ready to purchase it right away, you can always add it to your shopping cart so it will be easy to find later. In most cases, Amazon will keep track of your rope halter, and anything else in your shopping cart, for 90 days.